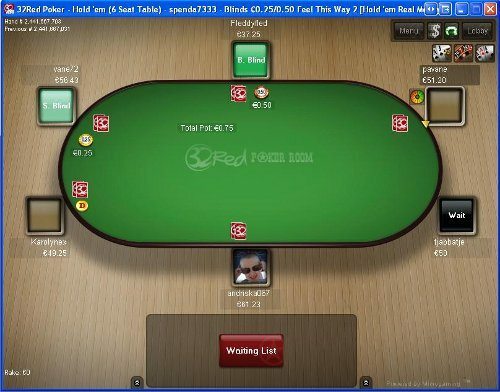 Despite their lack of U.S. players, 32RedPoker is an extremely frequented poker room, with hundreds of thousands of registered players on the site. They feature a wide range of stakes and games, even featuring a lesser seen game – 5 card draw. Also, as you would expect, they always have a slew of Texas Hold’em games available across all stakes to please the no-limit fans. While their tournament schedule isn’t extremely exciting at this moment, they feature a 65 dollar rebuy every Sunday, with a $175,000 prize pool! Despite the lack of a tournament structure such as you see at some of the bigger sites, they still do have some formidable tourneys such as this $175K guarantee. One favorite thing about 32Red Poker is how accessible the lobby and interface are. It’s extremely easy to find anything you want and in record time. You won’t waste time that you could spend playing. The 32Red Poker Lobby was recently updated to give players three different lobby-view options. On top of that, they added an instant play version, making 32RedPoker Mac compatible. The first view, the Filter Lobby, allows easy navigation across all games and stakes. There is a slider bar that can be moved from left to right which helps a player find the range of stakes he or she likes to play. The Standard Lobby view shows a player’s account balance without having to go into the cashier’s window. For players who like a traditional look, this view is certainly tough to beat. The third and final view, the Quickplay Lobby, allows a player to select the game they want quickly and without hassle. There are four icons on the screen including “Cash Games”, “Sit & Go Tournaments” and “Scheduled Tournaments”. The fourth icon is a “1-Click” button which allows a player to immediately go to their favorite game and stake. However, as is common with other Microgaming/Prima network sites, their tables are not too attractive. They are just simply not very easy on the eyes at all. However, the speed of the games match other Microgaming sites, as they are extremely fast and there is little to no lag time between hands. Even though their tables can be pretty ugly, they do have a lot of customizable features. You won’t find as much as you would on Full Tilt or PokerStars, but you can adjust the table size, add ‘game markers’ (displays how much money was in the pot on every street), 4 color decks, and set seat preference to put you in the same seat at every table (great for multi-tabling). You can also save hand history files on your computer and use them with Poker Tracker to keep track of your results. 32Red Poker is awash in lower limit cash games. You will never have any trouble finding a good game if you’re playing $.50/$1 and under. However, this is where you begin to run into a bit of a wall. The higher limit games tend to be deserted, creating a bit of a problem for those who are looking to play mid-to-high stakes. However, for those looking to build a bankroll this site is extremely good. The same conditions tend to apply to Sit ‘n Goes and multi-table tournaments on 32RedPoker.com. The tournaments are a disappointment. There are not enough of them running at any point of the day to satisfy those coming to 32RedPoker.com for tournament action. As earlier mentioned, they do have a weekly $175K guarantee tourney, but it’s not enough to cover the downside of their tournament structure. However, that is not to say that there is no way to make money on this site. The lower limit cash games, Sit & Goes, and tournaments are extremely juicy and are a great way to build your bankroll up. You just have to find them. Through our experience with 32Red Poker, we can safely say that there are a myriad of ways to make extra money on this poker site. From a sweet $1,000 Bonus, to their own Bad Beat Jackpot, and their very own form of player points known as Redbacks, 32RedPoker pulls out all the stops to offer you an enjoyable time at their site while making money. The $1,000 32Red Poker bonus can be earned just from a single $10 deposit! Simply make your deposit, then collect Redbacks. Your bonus amount will depend on how many Redbacks you collect within 30 days. You can earn the full $1,000 by collecting a total of 320,000 Redbacks. In addition to the $1,000 bonus, all players receive 30% rakeback automatically! Just convert your Redbacks to cash at the rate of 1,000 Redbacks per $10. Click here to join 32Red Poker! 32Red Poker is a room where you can feel your money is safe and feel confident that if you have a problem you will be able to fix it. They offer live 24/7 support on their site, which is easily accessible. All you need to do is log on and wait for a very short time until a support member of 32RedPoker comes on. After that, they will help you to the best of their knowledge. If that is not good enough, they have e-mail and various phone numbers you can contact them with.